The original Gwen Stacy may have been dead for 45 years, but that hasn’t stopped all sorts of variants of her from popping up. The most prominent of late is, of course, Spider-Gwen, who made her debut during 2014’s Spider-Verse event. The success of Spider-Gwen led to a series of Gwen Stacy-themed variant covers for the Marvel line, leading to the creation of the Deadpool/Gwen Stacy amalgam “Gwenpool.” Gwenpool has been starring in a string of self-titled books since, and just recently joined up with the relaunched West Coast Avengers. Oh, and she also has a Marvel Legend. Yay! Gwenpool is figure 1 in the Lizard Series of Marvel Legends, which was our first Spidey-themed assortment of the year. The figure stands just under 6 inches tall and she has 29 points of articulation. She’s built on the Spider-Girl body, which is sensible enough, given that’s the same body Hasbro used for Spider-Gwen. It lends some consistency to the Gwen Stacy-take-off characters. Gwenpool actually gets a fair quantity of new pieces to set her apart from all the other Spider-Girl builds. There’s a new head, upper torso, forearms, shins, and feet, as well as add-ons for her belts and backpack. 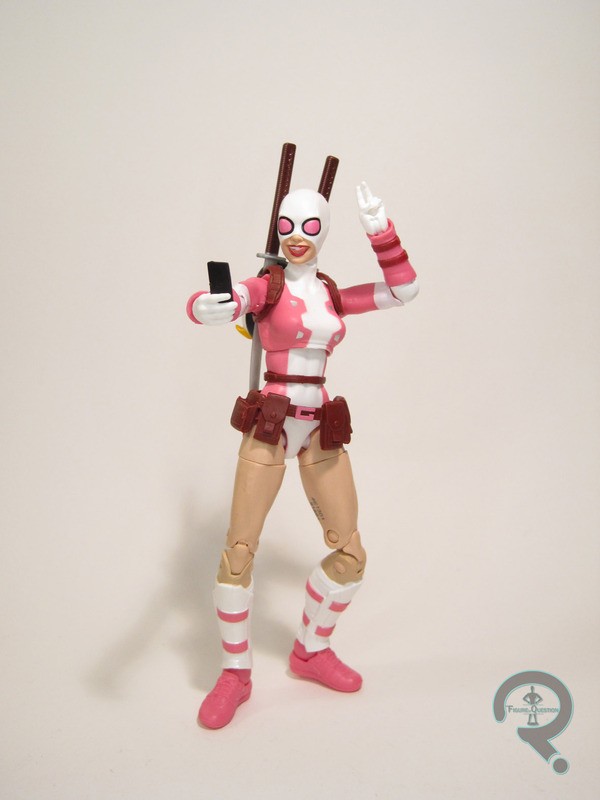 The parts all mesh well with the base body, and do a pretty respectable job of melding Gwenpool’s typically cartoony style with the established stylings of modern Legends. I really appreciate the little details that Hasbro has peppered throughout the sculpt, such as the piping on her socks under her shin guards. I also really like the implementation of the new ankle articulation (like we saw previously on Moon Knight and Spider-Punk). So, I guess, what I’m really getting at here, is that I quite like Gwenpool’s lower legs. Just go with it. The rest of the details are quite fun in their own right. Her facial expression is a nice big smile that feels very true to the character as established in the comics. I also really enjoy her penguin-shaped back pack. Gwenpool’s paintwork is clean and appropriately pink-heavy. Nothing particularly notable, but it works to get the job done. Gwen includes a nice selection extra accessories, including an extra head (with tongue out for proper selfie etiquette), her phone (which can be nicely stashed in her utility belt), a pair of katanas, and three sets of hands (in heart-shaped, phone-holding/peace sign, and standard gripping poses). It adds up to a rather expressive figure. She is also packed with the tail of the Build-A-Figure Lizard. I’ve got no particular attachment to Gwenpool, so I didn’t rush out to buy her. Sure, she came with a piece for Lizard, who I definitely wanted to build, but there was one other figure preventing me from completing him, so Gwen stuck nearer to the bottom of my want list. When I was finally able to get ahold of that other figure (who I’ll be reviewing tomorrow…spoilers), Gwen was along for the ride, because, dammit, I was finishing that Lizard figure. I may have only bought her for the Build-A-Figure piece, but Gwenpool is a fairly strong figure in her own right. I got Gwen here from my friends at All Time Toys. If you’re interested in buying Marvel Legends figures, or are looking for other cool toys both old and new, please check out their website and their eBay Store.